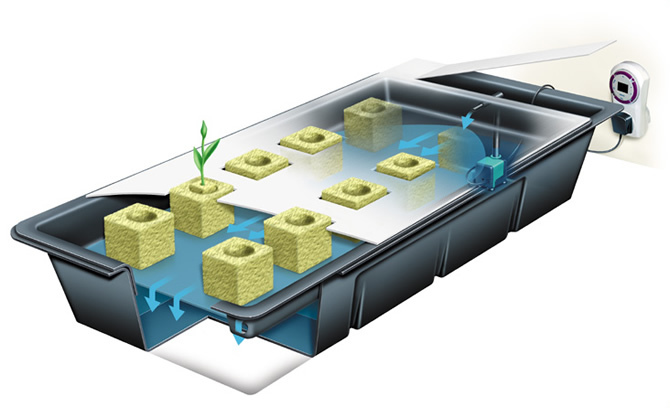 Nutrient Film Technique systems are claimed to be the simplest of all the hydroponics systems to use. For many years NFT (nutrient film technique) has been used by commercial growers and DIY growing enthusiast alike. Unlike other systems of this type the basics of NFT are really easy to grasp for newbie growers and seasoned growers alike. On this page we are going to have a look at how this NFT system is set up, the things you need to operate it and the actual operating process. Nutrient Film Technique describes this system perfectly. The process is relatively simple which is why so many growers favour this set up. It’s a system that is easy to use in smaller growing situations but it can also easily be scaled up to use on a commercial basis which makes it a versatile way of growing. A nutrient solution is pumped or fed from a tank or reservoir up to a purpose made tray or gulley. In some cases the trays or gulley is set off ground on a purpose built frame but some growers also use them flat on the ground, either way a gradient is needed to allow the solution to run down the system. The solution then runs down the tray or gully and back into the tank, it is then recirculated and pumped back up again. Larger commercial growers often use a run to waste process which simply means that instead of the solution running back into a tank to be recirculated it is discarded and fresh solution is circulated each time. We will come back to hydroponic nutrient solutions later in this article. Experienced growers usually use a type of ancillary mat spread along the bottom of the tray or gully, using this mat ensures that as the solution runs down the trays it spreads out into an even thin film, hence the name Nutrient Film Technique, the mat used here is often referred to as a spreader mat. NFT systems are available in quite a few different forms, some systems use trays and some use large gutter-like channels, they can also be made at home with a little bit of DIY knowledge and quite cheaply too. Home-made systems are worth thinking about so we will cover home-made growing systems on its own page shortly. Once the grower has decided which type of NFT system to use, the next thing to consider is the growing medium for actually growing your plants in (the medium is the substance that you use to grow your plants in, i.e. soil or clay pebbles and in this instance Rockwool), remember that hydroponic systems do not use soil to support or feed the plants so the popular choice in NFT systems is usually rock wool cubes or blocks. 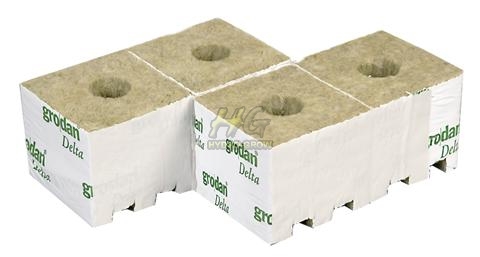 There are many decent brands of horticultural Rockwool such as Grodan and they generally come in various sizes with a pre-cut hole in the top to sit your plant into, good quality Rockwool cubes will also have little channels cut from the bottom of the block to allow the nutrients to pass through easier. All hydroponic systems need a nutrient solution to circulate to the plants. It’s this solution that provides everything your plants will need to thrive. A nutrient solution is water with added nutrients and enzymes, you can buy nutrients and all other additives from any good grow shop or garden centre. Many growers use their own concoction of nutrients and additives, in fact many keep their chosen nutrient mix a closely guarded secret because it’s fair to say that getting this part right is often done by trial and error and can take a long time to concoct the perfect combination, it can also have a massive impact on how the plants grow and the yield they will provide so take time to find what is best for your plants as different strains and breeds prefer different mixtures so do your research. 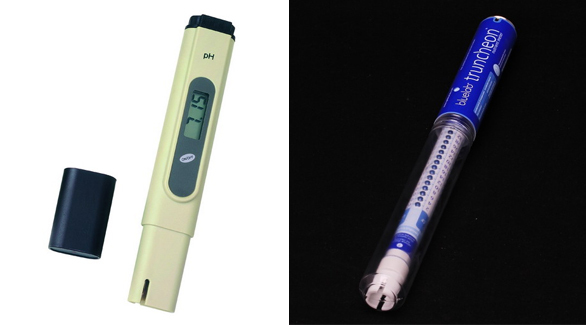 Your solution will need to be checked to make sure you have the right amount of nutrients and at the correct PH level, the easiest way to do this is to use a CF truncheon and a PH meter to measure your levels. Most common tomato plants enjoy a PH of around 6.0 and a CF of around 18 to 20 but many plants have different tolerances so it’s worth buying a CF truncheon for the nutrients and PH meter for the PH. Both can be bought quite cheaply online. Take time to learn about your chosen plants needs and adapt your mix to suit. So we now have a little understanding of the basics of NFT and nutrient solutions but what is the actual process of using the NFT system to grow? Just before we go any further here is a few words on seedlings or cuttings/clones. Usually your plant would come from a clone or a seed, when using NFT and Rockwool it’s advisable that you plant out and propagate your seeds or cuttings into small Rockwool cubes ready to be planted on the system once rooted and established. The smaller Rockwool cubes used for rooting should fit perfectly in the larger blocks. Assemble the system as mentioned above, fill the tank or reservoir up with a nutrient solution of your choice and ensure it’s at the correct strength and PH balanced. Cut spreader mat into appropriate lengths and add to trays or gullies ensuring that the whole bottom area is covered to create the nutrient film. Place Rockwool cubes or blocks onto the trays/gullies and space them out evenly allowing space for plant growth. Add plants that should be in the smaller Rockwool cubes to the larger blocks already placed on the system. Plug in pump and switch on to circulate the solution. Check that solution is circulating correctly and that the nutrient is running in a nice smooth film across the surface of the trays or gullies. So now you have learnt about NFT, you have all the basic knowledge you need to get you up and running. Once you get going you can expect some bumper yields from this type of hydroponics system, many growers claim that it’s an advanced way to grow because you have full control of how much solution and additives your crop will be given, some growers even claim that it can actually shorten the growth cycle so your plants could be ready to harvest up to one week earlier than other growing techniques. 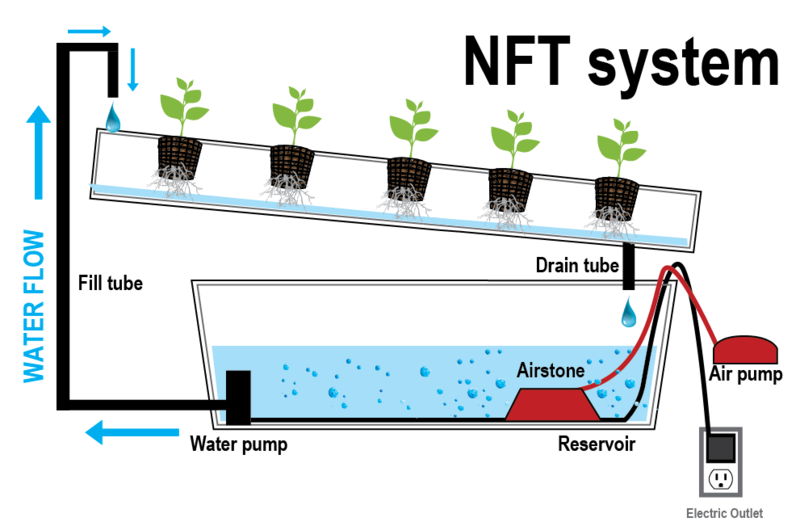 This is just a simple overview and it’s fair to say that there is much more to learn to master the NFT hydroponic systems, Be sure to look around the other pages on our site for more information on this and other hydro projects. Check out the how to build a Nutrient Film Technique system video below.